"I have no problem in stating, in retrospect, that it might have been a bad idea to take this assignment”, CEO of seismic services firm Spectrum ASA told media today. Now, Irish oil minor San Leon has to find another subcontractor to process the geological data they collect from the occupied territory in violation of international law. Irish firm San Leon and their UK partner Longreach are continuing their illegal oil search in Western Sahara. The UN has stated that such activities are in violation of international law. As part of their geological surveys of the territory, the two firms in 2009 contracted the London based Spectrum UK, which in turn is a subsidiary of the Norwegian seismic surveys company Spectrum ASA. Spectrum ASA stated in Norway's leading business newspaper Dagens Næringsliv that it was wrong of them to get engaged in Western Sahara. "We do not want to get engaged in Western Sahara. I have no problem in stating, in retrospect, that it might have been a bad idea to take this assignment”, CEO of the firm, Rune Eng, said regarding the work they did for the Irish. He said that the London office was probably not aware of the fact that the data came from Western Sahara. A few months ago, the UK office of Spectrum told Western Sahara Resource Watch that it was “probable” that they would take on further assignment for San Leon in Western Sahara, after San Leon’s fill-in seismic studies are completed this autumn. After being aware of the nature of their first assignment, they have, however, changed their minds. The Norwegian government urges Norweign firms to not get engaged in Western Sahara due to aspects of international law. See English translation of the story below. Western Sahara Resource Watch commends the principled and thought-through decision from the firm to abstain from further assignments for San Leon in occupied Western Sahara. “We expect San Leon to immediately follow the example of their subcontractor and pull out of the area. It is saddening that an Irish firm is leading the way in undermining the principles of international law. San Leon is directly contributing to uphold the conflict in the territory. It is frustrating that everyone seems to understand it – except San Leon themselves. The Saharawi people has never given San Leon the green light to work on their land", Maiju Kaipiainen of Western Sahara Resource Watch stated. WSRW has sent numerous letters to San Leon, none of which have been replied to. Several oil companies and oil services firms have left Western Sahara over the last years, after being made aware of the nature of the conflict. Makes U-turn: The Norwegian seismic services company Spectrum has assisted oil companies in disputed Western Sahara. Now the firm says ‘no’ to further assignments. More than 30 years after Morocco seized control over Western Sahara through a bombing campaign, the oil companies San Leon and Longreach shot seismic in the same territory. Data from the disputed territory has been processed by the Norwegian company Spectrum, of which [Norwegian businessman] Øystein Stray Spetalen is the biggest owner and a board member. The company has, through a so-called 3D processing, given the oil firms a clearer picture of the underground. “Spectrum’s engagement violates the rights of the Saharawi people. Neither Spectrum, San Leon nor the Moroccan authorities have consulted the Saharawi population”, said Erik Hagen, secretary- general of the Norwegian Support Committee for Western Sahara. Norway does not recognise Morocco’s annexation of Western Sahara, and the Ministry of Foreign Affairs has for many years advised Norwegian firms against getting engaged in the territory. The Legal Office of the United Nations expressed in 2002 that all further oil exploration in Western Sahara will be in violation of international law if the local population is not consulted, and if it does not benefit from the industry. Hagen of the Norwegian Support Committee for Western Sahara points to the fact that the issue of natural resources and the petroleum is part of the peace talks between Morocco and the liberation movement Polisario. “San Leon’s exploration activities are directly contributing to undermine the UN peace process, and makes the process of decolonisation of Western Sahara that the UN is striving for that much harder”, Hagen stated. Several Norwegian firms have over the previous years learned that small and big business adventures in the occupied territory means trouble. Norwegian Broadcasting Corporation [NRK] revealed that GC Rieber Oils had important fish oil from Western Sahara without paying customs. The issue led to Paul-Christian Rieber losing his position as president of the Confederation of Norwegian Enterprise [NHO]. Also the partially government owned company Yara had to repent after importing phosphates from a mine in Western Sahara. Rune Eng, CEO of Spectrum ASA, realises now that taking on the assignment of analysing the data from the politically disputed area was wrong, and that they will say ‘no’ to future assignments there. “We agree with the Support Committee, and has said that we do not want to get engaged in Western Sahara. I have no problem in stating, in retrospect, that it might have been a bad idea to take this assignment”. Spectrum was awarded the contract in April 2009. The company was, according to Longreach, to process seismic data from the so- called Tarfaya block, and get 200.000 Norwegian kroners for the job. 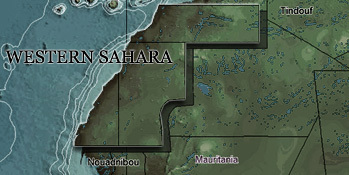 The block stretches far into the territory controlled by the liberation movement Polisario. Eng considers the whole thing “a minor issue”, and does not believe Spectrum had been aware that the data sent their London office was from Western Sahara. “We got message that there is such and such data that needs to be reprocessed, and that it is onshore material. It could be Myanmar, Cuba or Western Sahara. We are here talking about second round processing. What we see is a number of tapes entering the office. So we don’t necessarily know where the data originates from”, Eng said. He says that the company now will make an assessment on a project to project basis, and that they will still consider taking on assignments in Morocco proper. “From what I understand, San Leon has a pretty big engagement both in Western Sahara and in Morocco. It has blocks that are disputed and blocks that are not. Then we would simply have to ask for maps, to see where the data originates from”. Both Morocco and the Saharawi Arab Democratic Republic (SADR), led by the liberation movement Polisario, claim sovereignty over Western Sahara. When the colonial power Spain withdrew in 1976, Morocco occupied the territory. After several years of guerrilla warfare, the parties in 1991 reached a ceasefire agreement, each party controlling sectors of the territory. Today Western Sahara is divided in two by a 2200 kilometre long wall erected by the Moroccan army, and only the inhospitable areas to the east and in the south are controlled by Polisario. Over 165.000 Saharawis live as refugees in the neighbouring country Algeria, and Western Sahara is considered as the last unresolved colonial issue in Africa.